Hey folks, so a few interesting items for the week. 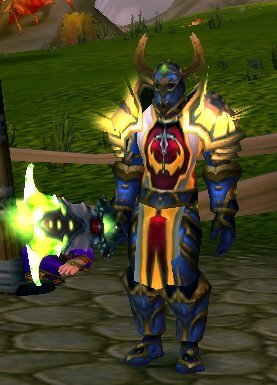 I had someone in my guild tell me "Being a good Ret Pally is like wining the special olympics - you may be the best out there but you're still a retard"
I ran into a Ret Pally on my server who recognized me and let me know he reads the blog! SWEET, I"M FAMOUS :).... Seriously it was nice to see folks enjoying the blog! So Kyllia, Kelf and I ran 3's again last night. If you read my previous post, we tore it up last week, but I was unsure if we just got lucky or if this would realy work. We needed to play again to find out. I think the guys were feeling the same way. So... did we tank or own? So we got together around 10pm. I think we were all a little rusty. Unlike the last two weeks where I had gotten 100+ games in with Kyllia, this week we only played 30 or so, with all of those early in the week. As such we got off to a rock start. The main problem was that Kyllia and I wern't synched up on a target. For example, facing a warlock/druid/warrior team, We'd start on the lock, and then there would be some confusion on whether to swap to the druid, or stay on the lock. It took us perhaps 5 matches to start synching up again. That left us at about 2-3, then we started coming back. 3-3, then a random DC left kelf disconnected in the middle of a match, and us at 3-4. We bravely kept fighting on untill 11:30. In the starting area of our final match I notice the oposing team has only 2 players... (YES) we run out and it's a shaman and druid, oh how I hate both of those classes! I had a feeling these OP motherfuckers thought they could do 3's one person short. And once we rushed them I was sure they knew what they were doing. Both behind seperate pillars, the druid right at the 30 yard mark.... But we're no idots either. We start on the Shaman and start working him down. When the druid pops, I briefly throw a stun his way and rush back to the shaman he's slowly going down. Kelf takes up position between the two pillars and keeps the druid stunned while we finish off the shaman. Then we all wail on the druid. I just had this feeling that it was an OP team and as we're taking down the druid I'm yelling "TAKE THAT YOU OP MOTHERFUCKERS! GIMMEE 25 POINTS!!" Match ends and we get +23 points! We end the night at 1611, ten points above our start. #2) I noticed a LOT more teams with one or two people with S3 weapons (and probably S4 other gear). We need to gear up as quickly as possible to close the gear gap.